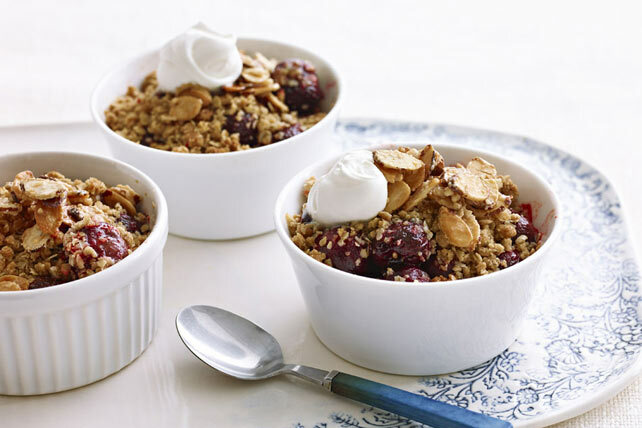 Thrill the after-dinner crowd with individual servings of our Sweet Cherry Crisp—topped with a brown sugar-and-oat crumble and baked in ovenproof mugs. Spray 6 ovenproof (1-cup) ramekins or mugs with cooking spray; place in shallow pan. Cook nuts and granulated sugar in nonstick skillet on medium-high heat 5 min. or until sugar is melted and nuts are evenly glazed, stirring frequently. Spread into single layer on baking sheet sprayed with cooking spray. Cool 30 min. Meanwhile, combine oats, brown sugar and 1/3 cup flour in medium bowl. Use pastry blender or 2 knives to cut in margarine until mixture resembles coarse crumbs. Whisk remaining flour, jelly powder and water until blended. Add to cherries in large bowl: toss to evenly coat. Spoon into prepared ramekins; top with oat mixture. Break any large nut clusters into small pieces; sprinkle over desserts. Bake 30 to 35 min. or until fruit mixture is hot and bubbly and nut topping is golden brown. Cool slightly before serving topped with Cool Whip. Enjoy your favourite foods while keeping portion size in mind. Prepare using thawed frozen pitted sweet cherries. These individual crisps can be baked in small baking dishes instead.